In April of 2015, Churton embeds with an expedition team who endeavor to summit Mt. Everest. Their world changes in an instant, when a force greater than 450 Hiroshima bombs erupts underground. A 7.8 magnitude earthquake scours the region, wiping out entire villages. Not even Mt. Everest escapes the quake’s deadly vibrations where the shaking triggers a mammoth sized avalanche that decimates base camp. Many lives vanish in a flash of white including a member of his expedition. Miraculously, Churton survives along with his camera and records the moments of terror as ice blasts by like cannon fire, obliterating his camp. Until that day, Churton films a documentary about an expedition’s attempt to summit Mt. Everest. For 24-days the camera captures an intimate portrait of life on the planet’s most prolific journey. The team consists of an international cast of characters such as American father-daughter team Randall and Haley Ercanbrack. Climber Vibeke Sefland, who is just off of a posting in Syria for the Norwegian Armed Forces, intentionally works in combat zones to earn extra money to support her climbing. Andrea Cardona, a sponsored climber, summited Mt. Everest in 2010 and is the first Guatemalan woman to do so. After being turned away the year before, she is hoping to do the double summit of Everest and nearby Lhotse. The expedition leader is revered mountaineer Garrett Madison who has led more clients to the top of Mt. Everest than any other Western guide. His right-hand is Ang Phurba Sherpa. Phurba leads a 25-man Sherpa team whose tireless work make the summits for Garrett’s clients possible. Keeping this massive fifty-person crew in good health is expedition doctor Eve Girawong. A registered nurse from New Jersey, she returns to “a place that has my heart” for the second year in a row. One year earlier in 2014, Churton is at Everest Base Camp as producer for a live-broadcast event. 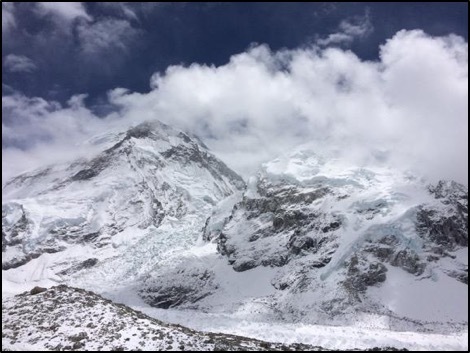 Sadly, plans change when sixteen Sherpa die in an early morning avalanche, making it the deadliest day in Everest history. The production team pivots and films a documentary on the tragedy. This experience in Nepal inspires him to return the following year to film his own documentary, where he finds himself again in the middle of the deadliest day in Everest history. Three years later, Churton returns to the region in hopes he can find closure to this period of life and reconnect with the beauty of the region. He encounters people along the way who call this place home to investigate how they have endured the deadliest natural disaster in over 600 years.